Burnout Revenge is the fourth video game in the Burnout series of racing games. It was developed by Criterion Games and published by Electronic Arts. It was released for the PlayStation 2 and Xbox on 13 September 2005 and Xbox 360 on 7 March 2006, alongside the PlayStation Portable and Nintendo DS title Burnout Legends. Burnout Revenge was also dedicated to the memory of Rabin Ezra, who died on June 27, 2005. Similar to its predecessor Burnout 3: Takedown, Revenge focuses on a mixture of racing in the midst of rush-hour traffic, and vehicular combat; players use the cars themselves as weapons. Revenge also expands on the combat side of its gameplay with new features such as "traffic checking" (ramming same-way traffic), Vertical Takedowns (landing on a rival car after the player's car drives over a jump), a new game type (Traffic Attack) and significant changes to the gameplay of Crash mode (a game type where players attempt to cause as large a crash as possible). A sequel to Burnout Revenge, titled Burnout Paradise, was released for the PlayStation 3 and Xbox 360 on 22 January 2008. There are two extra vehicles that can be unlocked by the presence of a saved game from another title on the memory card or hard drive when you first create your profile. A Madden NFL 06 save will unlock the Madden Challenge Bus and a Burnout 3: Takedown save will unlock the Dominator Assassin. Both of these cars are available only for Crash events. They are also available for online use if you own an online adapter. Although it may not be hidden, after reaching the "Elite" rank, you unlock the Black Elite Racer, which has some references to the game, Black. Example, there are bullet holes all around the car, and the license plate on the back reads "Kellar", the player's character in Black. The Xbox 360 version of Burnout Revenge included several new features and improved the graphics of the game to utilize the power of the console. The game included ten new crash junctions on the Crash Tour. It also included a vastly improved online mode that introduced online Revenge Rivals. This system allowed players to keep track of their number of times they have been taken out or have taken out any given player. The new version also included a new Burnout Clips feature, which allows to save 30-second clips of any offline race played and could be shared with other players over Xbox Live. Burnout Revenge has 41 licensed songs on its soundtrack and variety from different genres of punk, metal, hard rock, alternative rock and electronic. From artists The Chemical Brothers, Fall Out Boy, Thrice, The Bravery, to BT's unique remix of "Break On Through (To The Other Side)" by The Doors, also with "Lights and Sounds" by Yellowcard which headlines the soundtrack. The songs are played through "Crash FM" the game's radio station. The Xbox 360 version of Burnout Revenge was the first game to take advantage of kiosk downloads in North America, where players could take their Xbox 360 Memory Unit to participating stores such as GameStop, Circuit City, and Best Buy, and download new content for the game onto it. The provided content varied between kiosks. Xbox Live Marketplace content is also available in the form of new cars. The PlayStation 2 version received "universal acclaim", while the Xbox and Xbox 360 versions received "favorable" reviews according to video game review aggregator Metacritic. Jim Schaefer of Detroit Free Press gave the PS2 a score of all four stars and said that it "proves once again why it is the ultimate spectacle for those of us who just want to feel the rush. You know you're playing a great game when even the pauses in the action are filled with rockin' music, flashy video and big sound effects." Ryan Huschka later gave the X360 version the same score and stated that it "makes online showdowns much more personal." Greg Edwards of Maxim gave the PS2 and Xbox versions a score of nine out of ten and stated: "Tons of tracks, events, and online races give Revenge plenty of variety, but it's the blinding speed and the velvety smooth controls that make this the best racing game of the year." Eliot Fish of The Sydney Morning Herald gave the game four-and-a-half stars out of five and called it "relentlessly intense". However, Tim Meston of The Times gave it four stars out of five and stated: "The locations are varied, but with the usual generic locations, and a repetitiveness notic[e]able in the track layout for each stage is reduced somewhat by the addition of numerous shortcuts along each route." Scott Jones of the Hartford Courant gave it three stars out of four and called it "a car insurance agent's worst nightmare," but added that "there's still something a bit cold and heartless about the 'Burnout' series. Maybe it's all the phony cars (no real car manufacturers, for obvious reasons, were willing to lend their vehicles to the game). Maybe it's because your opponents lack personality. Maybe the series needs a narrative. There's no story, nothing to keep you playing, other than more difficult challenges. And that's just not enough." When asked about Burnout Revenge backwards compatibility with the Xbox One, Criterion said it had "no plans, but it is not out of the question." ↑ Bernardini, César A. (2 August 2005). "Madden Challenge Bus in Burnout Revenge". TeamXbox. Archived from the original on 20 July 2013. Retrieved 12 September 2014. ↑ Bernardini, César A. (23 August 2005). "Burnout Revenge Soun[d]track Revealed". TeamXbox. Archived from the original on 20 March 2012. Retrieved 12 September 2014. ↑ "Burnout Revenge". Xbox.com. Retrieved 12 September 2014. 1 2 Edge staff (November 2005). "Burnout Revenge (PS2, Xbox)". Edge (155): 98. 1 2 EGM staff (November 2005). "Burnout Revenge (PS2, Xbox)". Electronic Gaming Monthly (197): 134. ↑ Reed, Kristan (5 October 2005). "Burnout Revenge (Xbox)". Eurogamer. Retrieved 13 September 2014. ↑ Reed, Kristan (17 March 2006). "Burnout: Revenge (X360)". Eurogamer. Retrieved 13 September 2014. 1 2 Reiner, Andrew (October 2005). "Burnout: Revenge (PS2, Xbox)". Game Informer (150): 118. Archived from the original on 12 February 2008. Retrieved 12 September 2014. ↑ "Burnout: Revenge (X360)". Game Informer (156): 128. April 2006. 1 2 Johnny K (14 September 2005). "Burnout Revenge (PS2, Xbox)". GamePro. Archived from the original on 10 September 2005. Retrieved 13 September 2014. ↑ Johnny K (7 March 2006). "Burnout Revenge Review for Xbox 360 on GamePro.com". GamePro. Archived from the original on 10 April 2006. Retrieved 13 September 2014. 1 2 Hurh, JP (9 September 2005). "Burnout Revenge Review (PS2, Xbox)". Game Revolution. Retrieved 13 September 2014. ↑ Hurh, JP (28 March 2006). "Burnout Revenge - Xbox360". Game Revolution. Archived from the original on 24 July 2008. Retrieved 13 September 2014. 1 2 Gerstmann, Jeff (9 September 2005). "Burnout Revenge Review". GameSpot. Retrieved 12 September 2014. ↑ Gerstmann, Jeff (6 March 2006). "Burnout Revenge Review (X360)". GameSpot. Retrieved 12 September 2014. 1 2 McGarvey, Sterling (14 September 2005). "GameSpy: Burnout Revenge". GameSpy. Retrieved 12 October 2011. ↑ Williams, Bryn (9 March 2006). "GameSpy: Burnout Revenge (X360)". GameSpy. Retrieved 12 September 2014. 1 2 "Burnout: Revenge Review (PS2, Xbox)". GameTrailers. 4 October 2005. Retrieved 13 September 2014. ↑ "Burnout: Revenge Review (X360)". GameTrailers. 23 March 2006. Retrieved 13 September 2014. ↑ Bedigian, Louis (18 December 2005). "Burnout Revenge - PS2 - Review". GameZone. Archived from the original on 26 December 2008. Retrieved 13 September 2014. ↑ Wrentmore, John (2 October 2005). "Burnout Revenge - XB - Review". GameZone. Archived from the original on 7 October 2008. Retrieved 13 September 2014. ↑ Aceinet (23 March 2006). "Burnout Revenge - 360 - Review". GameZone. Archived from the original on 7 October 2008. Retrieved 13 September 2014. ↑ Roper, Chris (8 September 2005). "Burnout Revenge (PS2, Xbox)". IGN. Retrieved 12 September 2014. ↑ Miller, Jonathan (6 March 2006). 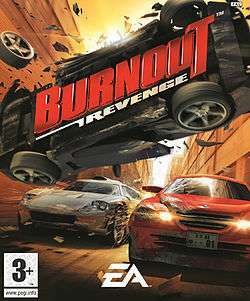 "Burnout Revenge (X360)". IGN. Retrieved 12 September 2014. ↑ "Burnout Revenge". Official U.S. PlayStation Magazine: 104. November 2005. ↑ "Burnout Revenge (Xbox)". Official Xbox Magazine: 132. November 2005. ↑ Price, Tom (April 2006). "Burnout Revenge (X360)". Official Xbox Magazine: 81. Archived from the original on 15 December 2007. Retrieved 13 September 2014. 1 2 Schaefer, Jim (18 September 2005). "CRASH AND BURNOUT: 'Burnout: Revenge' is pure adrenaline rush". Detroit Free Press. Archived from the original on 19 September 2005. Retrieved 12 September 2014. 1 2 Huschka, Ryan (19 March 2006). "'Burnout Revenge' (X360)". Detroit Free Press. Retrieved 12 September 2014. 1 2 "Burnout Revenge for PlayStation 2 Reviews". Metacritic. Retrieved 12 October 2011. 1 2 "Burnout Revenge for Xbox Reviews". Metacritic. Retrieved 12 October 2011. 1 2 "Burnout Revenge for Xbox 360 Reviews". Metacritic. Retrieved 12 October 2011. ↑ Edwards, Greg (13 September 2005). "Burnout Revenge". Maxim. Archived from the original on 13 September 2014. Retrieved 5 September 2015. ↑ Fish, Eliot (24 September 2005). "Burnout Revenge". The Sydney Morning Herald. Retrieved 12 September 2014. ↑ Jones, Scott (12 September 2005). "Crash Crazy". Hartford Courant. Retrieved 12 September 2014. ↑ "'No plans' to bring Burnout Revenge to Xbox One backwards compatibility - Burnout: Revenge for Xbox 360 News". Retrieved 2016-09-21.